Below is an email I received from the Orangutan Project outlining where our donations went this year. We focused on supporting the re-vegetation of the forests and peat beds which anyone who knows how peat beds burn is devastating as they literally burn & smoulder under the forest and drying out the moisture which enables the ecosystem. They have smouldered out of control over the past few years and the impact to all flora & fauna has been devastating. We are proud to be involved in this project of regenerating these peat beds. Over the last few years we have expanded from Just supporting adoption of Orangutan but the wider catchment including flora & fauna from the same demise as Orangutan. Have a read and hopefully you feel as proud as we do with the little we do to do our bit as a community. Indonesia continues to experience absolutely devastating forest fires every year, and Kalimantan, with its peatland forests is one of the worst affected. It’s a tragedy – but together we stepped up, and for 600,000 hectares and 6,000 surviving Bornean orangutans we’ve made a game-changing difference – we’ve secured their survival. Your donations are now helping secure and protect the habitat and lives of 6,000 Bornean orangutans – thank you! Right now, your donations are being directed straight to the Sabangau rainforest where our partners are accelerating their work to build strong dams into the man-made logging canals, to stop the flow of water from the forest floor. They urgently need to build 150 in the next year, whilst painstakingly monitoring and repairing existing dams so they stay in top condition. The end game is to retain water beneath the forest floor, keeping the peat damp and protecting this precious ecosystem from fire. Your donations are also funding local fire units, who with very little protective equipment patrol this landscape throughout the dry season, extinguishing fires before they take hold. This is happening right now – even researchers, brought in to study the long-term effects of poisonous smoke on orangutan health, have dropped their spreadsheets and are physically fighting grass fires in this precious ecosystem – and your gifts are providing them with the equipment they need! And of course, like so much of our work this project must cover multiple, but equally important issues. Alongside constructing dams to prevent fire and resourcing teams to fight fire, your funds are supporting the local community to grow and replant native trees already lost to fire, and fund outreach programs so more and more people surrounding this precious ecosystem understand the new dangers of clearing by fire. And finally, your gifts are funding Wildlife Protection teams – who patrol these forests day and night – untangling snares, infiltrating poaching networks and vigilantly protecting the last stronghold of the Bornean orangutan. Thank you so much to all who gave so generously to this critical appeal – we were given an opportunity to protect something extraordinary – and more than 2,000 of you stepped up, gave generously and did just that! 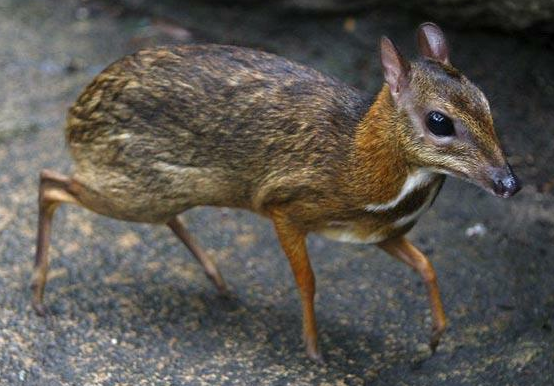 And, just as a reminder that when we protect orangutans, we also protect many other vulnerable species – here’s the latest little gem being protected by your donations, the Lesser Mouse Deer – recently photographed in the Sabangau rainforest! Who’s on the path to freedom in Bukit Tigapuluh? For many years your support has helped us protect land in the Bukit Tigapuluh ecosystem and secure the Open Orangutan Sanctuary – one of only two Sumatran orangutan release sites in the world! We’ve now re-introduced more than 170 orphaned and ex-captive orangutans into this protected habitat, and many of those females are now raising babies of their own – a vital new generation of Sumatran orangutans – wild, free and protected! Little Chilli is just one of the orangutans born in our Bukit Tigapuluh Open Sanctuary. He and his ex-captive mother are now free and protected thanks to your support! Orangutans entering the rehabilitation and release program at Bukit Tigapuluh have usually been orphaned and kept as pets, often in horrendous conditions. Upon confiscation they’re taken to the Sumatran Orangutan Conservation Programme’s Quarantine Centre for urgent medical treatment and care. Infant orangutans usually complete their pre-school training at the Quarantine Centre, where they’re carefully monitored to assess their skills, temperament, mental health and best pathway towards release. We’re finding that younger orangutans are often able to learn faster and adapt to jungle school quicker than older orangutans and as such some orangutans are now being sent to our Bukit Tigapuluh Open Sanctuary to commence their release training as young as three and a half years of age. Whilst that’s fabulous news, it means we’re having to divert more resources to this program to care for these younger orangutans as they’re prepared for release. Six young orangutans arrived at the Sanctuary in Bukit Tigapuluh in February this year and are now enthusiastically participating in jungle school, learning how to travel safely in the jungle canopy, forage and source nutritious food and make secure nests. The ground-staff at Bukit Tigapuluh need to be fairly multi-skilled themselves, as the path to freedom for ex-captive orangutans is not an easy one. Medical support is provided by a senior veterinarian in charge of our reintroduction program, and she’s assisted by a junior vet. Medical support is provided throughout the whole reintroduction process and every orangutan is checked monthly to make sure they’re in good health. The team have also developed a comprehensive behavioural enrichment program so the orangutans are stimulated and engaged when in their enclosures. Sessions vary to provide ongoing challenges, and their food rations will often be hidden in leaves, boxes, sacks, feeder balls and other toys. These are often the toys you’ve purchased on behalf of your friends and loved ones through our Christmas catalogue! Orangutans must also be able to find and identify a minimum number of food items in the jungle before they’re ready for release. Jungle school is of course, just the entry gate to ultimate freedom, so every orangutan is carefully monitored during their skills training, with particular attention paid to their feeding, resting and travelling habits. 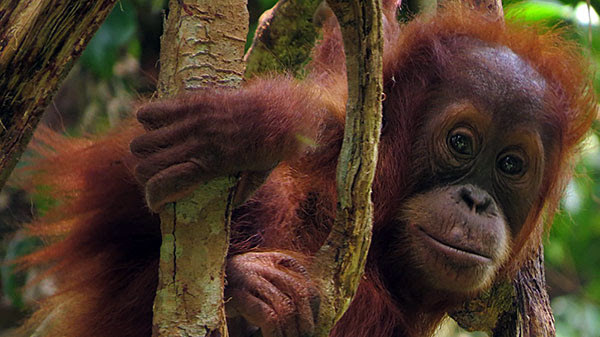 Once an orangutan is released into the jungle, they’re extensively monitored for many months, sometimes years. The release area in Bukit Tigapuluh is patrolled and protected by our Wildlife Protection Units and many local people are employed by this program. Poaching poses a constant threat to most species in Indonesia, including deer and tigers and poaching snares are persistently removed whilst the Wildlife Protection Units are on patrol. 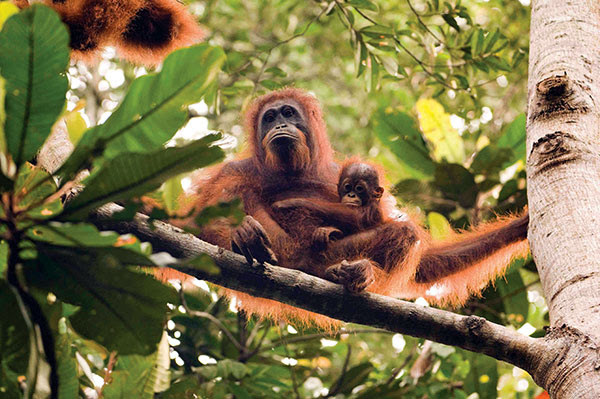 Thank you, your support has helped make the unique Open Orangutan Sanctuary in Bukit Tigapuluh a true reality. Watch this space, because we’re working to secure more habitat in the Bukit Tigapuluh ecosystem. We’ll keep you posted! We also have an amazing and growing number of women working on the ground in our protected landscape in Bukit Tigapuluh. This team below are helping to monitor precious herds of elephants in Bukit Tigapuluh and are working with local communities to reduce human – elephant conflict. Tragically, there are fewer than 1,100 Sumatran elephants left in the world, and our protected ecosystem is fast becoming one of their last remaining safe havens. Where once young male elephants would leave their female relatives in search of a new herd, there are now no new herds left to find. Where once they could roam freely over thousands of hectares, their remaining habitat is so fragmented, it is impossible for elephants to access other herds without trampling human-dominated landscapes. This is not just an ecological tragedy, it’s a personal one. Elephants are deep thinking and sentient – young males quickly become isolated, angry and destructive, destroying the livelihoods of subsistence farmers and harming local people. Part of the work at Bukit Tigapuluh is to monitor and relocate young males to one of a few remaining herds, creating happier elephants and ensuring future populations are genetically strong. We’re also striving to create protected corridors in the remaining forests surrounding Bukit Tigapuluh so elephants can travel safely between habitats. 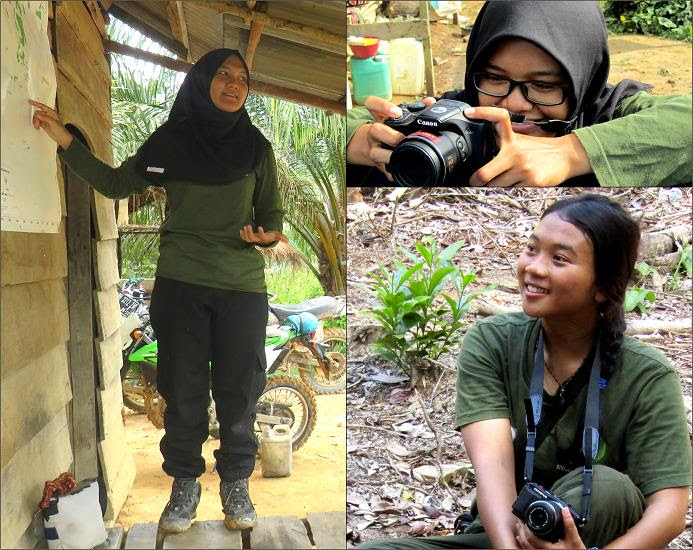 Community Affairs Officer Dyana Permata Sari (left) with Meli (upper right) and Syenit (lower right) are working together on elephant monitoring and protection in Bukit Tigapuluh. They’re also working on a new training and education program to teach future Indonesian farmers to co-exist peacefully with these deep thinking, gentle giants. When you give a gift in support of our work in Bukit Tigapuluh, you’re also helping to protect some of the last remaining Sumatran elephants and safeguard them from poaching. You can also give a gift to directly support the elephants of Bukit Tigapuluh through our sister organisation, the International Elephant Program.